This article follows the announcement on 11th August 2015 by the Australian Government that the climate action target they will take to Paris in December will still leave Australia as the nation with the highest CO2 equivalent output per head of population in the developed world. Such a target is woefully inadequate and not what any reasonably informed person or business should accept. I probably first became conscious of the environment’s finite capacity to adapt to industrialisation when I was three. Sixty three years ago. It was the great smog of London of December 1952. It’s probably my earliest conscious memory. The smog was induced by a combination of wood fires, brown coal home heating and a climatic inversion from an early December cold spell in 1952. It was London’s worst ever. 4,000 or more died, according to official records. As a result, despite pressures from the mining industry (an industry that had employed my father in the 1920’s and to which he was fiercely loyal till the day he died) – the Clean Air Act of 1956 banned smoke-causing fuel, and widespread adoption of central heating throughout London made that kind of disaster unknown today. Source: Met Office. On December 8th 1952 The Great Smog (Source Great London Authority) reached a staggering 4.46mg/m³ in smoke concentration. In London today the air quality on a typical winter’s day contains some 350 times less smoke and sulphur dioxide than it did a little over 60 years ago. In those days people listened to scientists. They acted in the interests of the whole community. In later life we have all seen the struggle to lower emissions from motor vehicles. A good car today produces just 130g/km CO2 emissions. In 1980 that was typically nearly 300g/km. Quality of air and lower particulates all have been guided by science. The car industry predictably said it was impossible and fought legislation. The broader community interest was respected and car-makers found a way. We have witnessed the end of chlorofluorocarbon aerosols (CFC’s) and we have seen the ozone layer gradually start to repair itself nearly two decades after their worldwide ban. Manufacturers said it would unacceptably raise the price of refrigerators. Science prevailed and manufacturers found new non-toxic refrigerants. In those days world leaders listened to scientists. They passed national legislation and the world acted before irreversible damage occurred. The worldwide community benefited. When smallpox was infecting more than 10 million people a year and as recently as 1967, according to the WHO (World Health Organisation), killing two million, science stepped up, through painstaking methodology and collaboration smallpox was eliminated in 1979. The world listened to science, acted and perhaps fifty million people are alive today that would otherwise have died. So why is Climate Science disregarded by so many legislators, largely of the conservative end of politics and media, and fought against by the vested interests of Big Energy and selected sections of the media? Sea-level increases which threaten many of the world’s leading cities by 2100. Loss of crop viability and food supply from traditional food production sources through changed seasons. In 1959 NOAA, at the Hawaiian facility at Mauna Loa, started taking readings of Carbon Dioxide concentrations in the atmosphere. In 1959 there were an estimated 3.1 Billion people on earth. 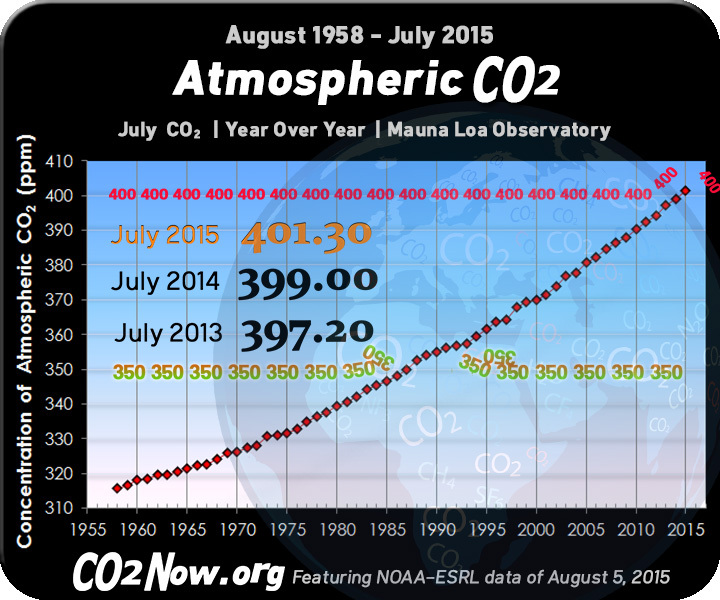 The CO2 readings were recorded as 315ppm (parts per million.) On August 5th 2015 those readings are a staggering 401.3 ppm. Earth’s population has more than doubled, to around 7 Billion. Science tells us that for Earth to achieve a total temperature rise of no more than 2 degrees Centigrade, a limit in total emissions by 2035 must be achieved – it’s our Budget. That is, how many tonnes of carbon can be burned until 2050. For Australia that means we can consume a total of 10.1 Billion tonnes by 2035. The announcement by the Abbott government targeting a 26% reduction by 2030 on the 2005 emissions level leaves us with a couple of million tonnes of CO2 to burn in the ensuing 20 years. In other words the target is too low and it comes too late when only 5% is targeted by 2020. The announced Australian Government policy will prevent us achieving our share of containing world temperature rise to just 2 degrees. It still leaves Australia near the top of CO2 emitters per head. It caves in to vested energy interests (many of whom pay almost no taxes and receive huge subsidies and permit wavers on emissions, especially older coal-burning power plants.) It puts at risk millions of jobs. At worst it condemns future generations to increasingly unliveable conditions with an ever-narrowing window of opportunity to reverse the effects of human impact. With more people on earth demanding ever better conditions, the world now demands more food. Producing more meat, crops and vegetables, consumes huge amounts of water. Water is a commodity the quality of which is in ever smaller supply, thanks to the ravages of excess chemical additives, mining and other pollutants, including poor waste management in much of the developing world. Animals in ever greater number, farmed for growing populations, produce more methane. Methane is some 25X more significant than CO2 as a heat-trapping gas. Unlike Carbon Dioxide it has a life of around 30 years in the atmosphere (Source EIA), so reducing methane levels is also vital and shows results more quickly in reducing greenhouse gas totals. CO2 is much more complex. Some has an atmospheric life of about 50 years, up to 1/3 in fact. About 50% hangs around for a hundred years or more. A core base amount of about 15% just does not dissipate in less than tens of thousands of years. So keeping fossil fuels in the ground, not emitting carbon dioxide through burning these fuels, is vital to reduce the rate of consumption of our carbon budget. The Climate Council (of Australia) has an excellent article on this. Carbon Emissions come from a huge variety of man-made devices and behaviours. Transport, Power, Domestic and Business Use, Agriculture, Energy production itself, Other such as mining and deforestation. At a micro level you can divide up your personal contribution and you’ll find your household probably produces about between 4 and 10 million tonnes of CO2 gases a year. Let’s say you wanted to to disregard the government target of a national 26% reduction by 2030. Let’s say for YOUR personal budget and activity that YOU want to do it in 3 years and give the nation as a whole more time to solve bigger issues in agriculture, land clearing, energy production etc.. Let’s also say that you want to double that target to over 50% reduction. Ambitious and at some cost? Yes. Possible. Actually, also yes! I am researching the proportions of these that are typical and will report soon to give greater clarity. But as a start here are some ideas with some very approximate opportunities. Some are likely to be low in estimation, some high. Overall I think they are about right in total. But I will gather more facts and correct the errors in this quick thought-starter list. Install solar water heating, further reducing power use (5%). Anti-social as it may be, throw out the bar fridge – save another 3-4%. Reduce cooling in summer to 22 degrees or simply cease air-con use (if fitted) by using fans instead (5%). That’s an estimated 55% reduction. I accept my estimates could be wrong by up to 1/3 until I get better facts. But even that would still be a 40% reduction achieved in 3 years. THE SOONER WE REDUCE CARBON OUTPUT THE BETTER OUR CHANCES OF ACHIEVING A MAXIMUM 2 DEGREE TEMPERATURE LIFT. These percentages are the percentage impact on base emissions. They are approximate and will vary by family situation and location. Tasmania will have different emissions drivers and levels than those in the Northern Territory. If you install a 10Kw/hr solar electricity system with attendant lithium storage, another 15% net emissions reduction is achieved by you. Remember too that if you take into account all the losses in production, transportation and transmission, the grid-supplied electricity we consume is only about 75% of what’s produced. Transmission losses and other inefficiencies account for the rest, depending on where you live and the age of the infrastructure over which the electricity is carried. There you have more than 50% without Solar PV cells, and 65% with your own solar power supply. You created jobs for lighting installers and the producers of those lights, manufacturing and installer jobs for a new energy efficient TV, more labour demand in building products from insulation and window installers, demand for growers market manpower in local markets and agricultural and tree experts. Some 75,000 Australians are employed directly or indirectly in the Coal sector. (Source ABS). Given 9 million homes and half a million businesses (Source ABS) many more than those 75,000 people could be employed in energy and emissions conservation businesses, possibly not at the elevated remuneration levels of FIFO workers, but also not incurring the huge medical bills from poor diet, ingestion of pollutants and particulates. The government talks about preserving jobs. Even if that seems plausible, the reality is that the world is changing. China rejects our agriculture exports from time to time for all sorts of contaminants which they perceive exceed acceptable levels. In the future, complying countries may simply impose penalty duties on goods from countries like Australia not paying their way on the environment. Our food bowl of Asia may have no Asian markets if they reject them because of our incapacity to contribute fully on emissions. It’s a real possibility. Tens of thousands of export jobs would be at risk. The 26% draft reduction target that Australia is taking to the Paris round will leave Australia with the highest emissions per head of any developed country (Source CCA). Science already has computed what we need to do. Now we need to do what generations have done for decades: Trust science, follow the advice and then implement plans to spend our carbon budget as slowly as possible by taking immediate action – NOW! My six year-old grandson deserves to inherit a country that is capable of sustaining life as we know it and making its contribution to world efforts to arrest temperature growth. Of course a few billion less mouths in the world would help. But given that’s what we have, if everyone reduces the load, we have a chance. But don’t let Australia just lope on down to 2030 and say it’s someone else’s problem. For in 2030 I want my grandson to be celebrating his 21st birthday and not fearful of a world that our generation stuffed up. We must embrace the possibilities and work to achieve them, through innovation, creativity and encouragement now. That’s what a Clever Country* would do. Wouldn’t it? All Rights Reserved. All Text © Copyright John Swainston, 2015. ISBN: 9780732908805, published in 1996. I do not think an appeal to TA and his government based on science will be successful. He partially understands political science as Hartcher wrote earlier this week. His abject failure of an emissions policy needs to be brutally subject to people power. Ballot box ultimately, but we really need an outpouring of dispute and disgust aka moratorium years in 1960’s. Your article can generate people power. In reading your blog why did Malthus come to mind???? Thank you for this chance to read and to think.